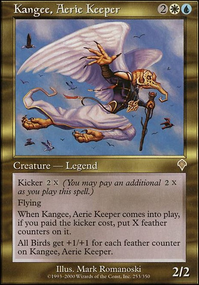 Bird tribal EDH deck based around Kangee, Aerie Keeper . I just really love birds, and when I saw Kangee himself I knew I had to make this. Strategy is basically just get birds out, make them big, and swing. Archetype of Imagination is in to make our birds pseudo-unblockable, and can be a win condition alone.